Travis Poling first discovered the haiku of Basho and the Beats in high school, and started experimenting with it as a part of his poetry and photography practice in his late thirties. His broader artistic work focuses closely on the natural world through abstraction, plain speech, and pilgrimage through the regional landscape. 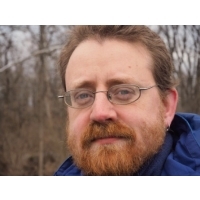 Poling grew up in the Cumberland Valley forests of Pennsylvania and Maryland, and currently lives in the wooded plains of east central Indiana where he teaches writing to college students. His poems have been published in various journals and anthologies, and his photographs have appeared in group exhibitions in Indiana. to walk between the rows?